It was the summer of 1965 when Medicare was created to provide government-sponsored health care for seniors. Today some $381 billion tax dollars a year are spent on Americans 65 and older. But in recent years, more and more Americans — 8.3 million and rising — are getting Medicare through private insurance companies. Tonight, CBS News chief investigative correspondent Armen Keteyian takes a closer look at the program critics charge has turned into a disadvantage for seniors, and a windfall for the insurance industry. It was the winter of 2003 when Congress, in the dead of night, overhauled Medicare. "This prescription drug benefit is a good deal for all seniors," said Rep. Dennis Hastert, R-Ill. But buried inside the bill was another deal — one that CBS News investigation has discovered was not necessarily a benefit for seniors. A large portion of one of the most successful public programs in history was quietly placed in the hands of private insurance companies. The goal of Medicare Advantage: to provide seniors with more benefits, like vision and dental care, and control rising costs. But today, for seniors like Aaron Cohen, it's become Medicare Dis-Advantage. "I'd rather go back to the old-fashioned Medicare," Cohen told Keteyian. Cohen, an 86-year-old who lives in Connecticut, says he switched to an advantage plan only after a salesman assured him he would be completely covered while staying in Florida. But after breaking his leg in that state, Cohen began to believe he had been sold a bill of goods. "There was something radically wrong," Cohen said. "They wouldn't give me any home therapy, claiming that it wasn't covered." But that's only part of the problem. With traditional Medicare, there's one plan for everyone, everywhere. Private Medicare Advantage offers as many as 50 different plans, causing untold confusion over coverage, premiums, co-pays, provider networks. "These insurance benefit packages are very complicated. Almost nobody without really technical sophistication can figure out exactly what they are buying," said Robert Hayes, who runs the Medicare Rights Center. Hayes said every year his staff fields thousands of calls from seniors scared to death they've made the wrong choice. Not only are private plans more confusing, they are more expensive to taxpayers. In fact, three independent reports found private insurance companies are paid, on average, 12 percent more than what it cost the federal government to run Medicare — in some cases, 50 percent more. FYI: Find out more about private medicare and how to find help navigating the system. The head of Medicare insists private plans give you more for your money. "I think there is a lot more that we could do in regular Medicare that we aren't doing currently, that some of the Medicare Advantage plans are able to do because of how the payment structure works," Leslie Norwalk told Keteyian. "Well, it's required by law: 25 percent goes back to the federal treasury, 75 percent goes back to the beneficiary," Norwalk said. "There, there would be, I'm sure, some small amount to administer the additional benefits," Norwalk said. But CBS News has found that's not always the case. An independent report found when it comes to the fastest-growing plans, known as private fee-for-service, half of that extra money goes back to the insurance companies. All these private Medicare plans are expected to cost taxpayers an additional $54 billion over the next five years. 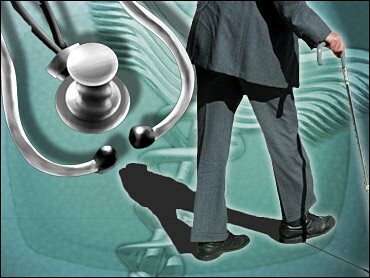 "Taxpayers are losing; people in Medicare are losing," Hayes said. "And the structure of Medicare as a national treasure that we need to rely on moving forward, is being undermined." Ironically, Cohen got one of the letters. On the back, his very personal feelings about his Medicare Advantage plan. "This plan is worthless," he wrote.